Chadmseger asks: Do you think the Bills will stay put at No. 9? Jay: I’d break down the odds of it like this: 50 percent move down, 35 percent stay put, 15 percent move up. If I was in charge, moving down would be my priority. In so doing, I’d be able to add another second- or third-round draft pick, which would help me fill another need. This team isn’t one player away. Another pick or two in the top 100 would help me find potential starters, or at the very least key depth players. If a move down doesn’t present itself, I’d stay put. The Bills should get a starter at No. 9, whether it be along the offensive or defensive lines, tight end or wide receiver. If one or two quarterbacks go in the top eight picks, that pushes players down to the Bills. I would not be in favor of moving up if it meant trading my second-round pick, No. 40 overall. Again, the team isn’t one player away, and trading No. 9 and No. 40 should mean trading two starters. If the cost to move up is less, it might be worth it, though, if a premier talent slips out of the top five. 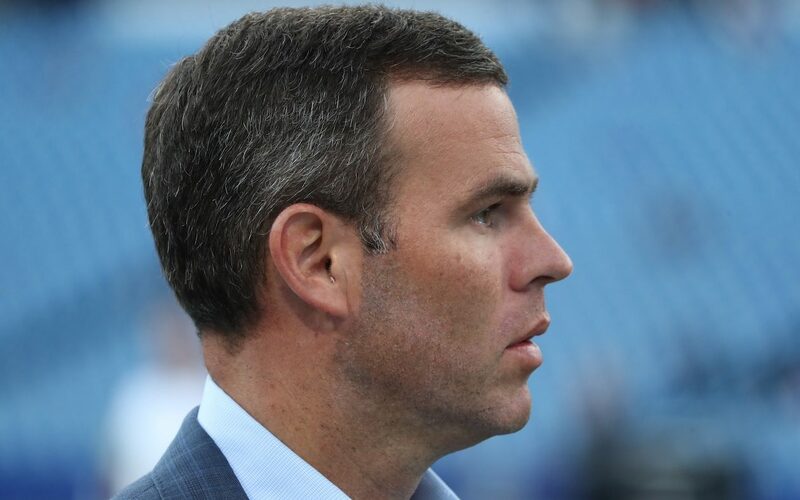 Luigi Mike Speranza asks: Thinking outside the box, as most of the free agents the Bills signed were backups or spot starters with their former teams, do you think Beane will get ultra-aggressive and trade up to nail a top-five offensive or defensive linemen for immediate impact? Jay: Let me start by disagreeing slightly with the first part. Mitch Morse, Cole Beasley, John Brown and even Quinton Spain played a lot of football for their former teams. As for the second part, we know that Beane isn’t afraid to be aggressive, but again, at what cost? If Alabama defensive tackle Quinnen Williams slips out of the top five, you could make a case it’s worth moving up. The same goes for pass rushers such as Nick Bosa or Josh Allen – as long as the cost doesn’t include that second-round pick. It’s easy to say that 10 draft picks aren’t going to make the roster, but those picked on the second day of the draft certainly will. Of course the Bills would be happy to move some of their Day 3 picks, but those are probably not going to get them too far up the board in the first round. As for offensive linemen, I don’t believe there’s one worth moving up from No. 9 for. Trevor asks: When I mock draft, I find it real hard to find impact edge rushers after Round 3. Do you agree? How likely is it the Bills take an edge early? Also, Tytus Howard from Alabama State has had so many draft visits. Does he go as high as the second round? The wide receivers in this draft interest me. I can find decent prospects from even Round 4 and on in mock drafts. Do you agree, or do the Bills need to take an impact wide receiver earlier? One more question, sorry. Do the Bills take a developmental quarterback? Brett Rypien from Boise State and Jordan Ta’amu from Ole Miss are two of my favorites. I get the feeling they like their QB room right now, though. 1. I’d say it’s hard to find impact at any positions beyond the top three rounds, with the possible exception of running back. By Day 3, you’re just hoping for contributors. There is a reason edge rushers are in such demand every year. Other than quarterback, it’s the highest-paid position on the field. I agree that if the Bills want to address it this year, they do it in the top two rounds. 2. Howard is absolutely a consideration in the second round. Most pre-draft rankings have him as a third-round prospect, but, of course, it only takes one team. 3. Signing Brown and Beasley has lessened the need at receiver. That said, neither of them qualify as a No. 1 receiver. 4. I don’t see them drafting a quarterback. The plan should be to get Josh Allen as much work as possible in the spring and summer. If the Bills want to add a fourth-string quarterback, it should only be as an undrafted free agent. If that player impresses during the spring and summer, perhaps they become a candidate for the practice squad. Chef asks: What do you think of the possibility/likelihood of Buffalo trading down in the first round, and getting an extra second- or third-round pick, then trading back up into the bottom of the second or third round (with 4-7 round picks) to grab falling talent? Whom could they target in the bottom second/third? Jay: I like what you’re cooking up there, Chef. (Sorry, that was terrible). I see the Bills having five positions that would make sense to address in the draft: Defensive end, defensive tackle, tight end, wide receiver, running back. If I can address four of them on the first two days, I’d feel really good about it. Trading down in the first round and picking up an extra second-round pick gives me a great chance to do that. I’d also be up for moving some of the Day 3 picks to get back into the third round. I agree that 10 draft picks aren’t making the roster. Eric Sepci asks: What’s with all the interest the Bills are showing in working out safeties before the draft? Doesn’t exactly seem to be even a marginal need at this time. Jay: By my count, the Bills have hosted two safeties on pre-draft visits -- Virginia's Juan Thornhill and Florida's Chauncey Gardner-Johnson. I don’t see any problem with that. Keep it mind, rebuilding the special teams is a priority this offseason, as well, and it’s possible the Bills are looking at safeties for that reason. I agree that Micah Hyde and Jordan Poyer are entrenched as the starters. Jim Eimer asks: Are Bills more likely to draft a kicker, punter or quarterback? Jay: Kicker. Stephen Hauschka had a tough ending to 2018, so it’s not crazy to think the Bills might want to send a message that his job isn’t guaranteed. Charles Schmitt asks: Which Iowa tight end is better? Good for No. 9 pick? Paul Catalano asks: Which Iowa tight end would you prefer if the Bills went that route? Rick McGuire asks: Last year the Bills drafted Harrison Phillips and it looked like a good pick. He'd play a year with Kyle Williams and eventually succeed him. Now the talk is the Bills are looking to draft Kyle's replacement. We need a franchise tight end before a defensive tackle. T.J. Hockenson at No. 9 makes more sense. Yes or no? Jay: Let’s put all the Iowa tight end questions together. Here’s where I stand on drafting a tight end at ninth overall: If you’re doing it, you better be getting Rob Gronkowski. The problem is, there’s only one Gronk. Any tight end drafted that high is going to have unreasonably high expectations. Also, with the depth at the position, it’s possible to get a contributor on the second or even third day of the draft, so that would be my preference. As for which one is better, Hockenson is thought to be the more complete player, while Noah Fant is the more explosive athlete. What made Gronk so great was his ability to dominate as a blocker. Hockenson similarly excels in that role. The flexibility he would give an offense makes him more valuable than Fant in my mind. As for the bigger need, defensive tackle or tight end, flip a coin. By signing tight end Tyler Kroft and re-signing defensive tackle Jordan Phillips, the Bills have players who can start in a pinch. The point about Phillips is a good one, although he doesn’t play exactly the same position as Williams. The Bills have Star Lotulelei to plug in the middle of the line. The other defensive tackle needs to make plays in the backfield. BigD asks: Regarding Christian Wade, there seems to be some question as to whether the NFL International pathway rules allow him to play this year. It doesn’t seem a stretch for his rugby running skills to translate to an NFL running back role. Can he play this year if he makes the roster? Jay: If he makes the 53-man roster, he can absolutely play. If the Bills want to keep him around to develop him more, he can be added to the practice squad with an exemption. If that’s the case, he would be ineligible to play for the team in 2019. Chells asks: Tell us the truth: Are you really going to pay attention to the draft or are you going to the early showing of Avengers 4 that Thursday? Jay: I honestly can’t tell you the last time I’ve been to the movies. I’m the least “movie guy” there is. I also haven’t seen Avengers 1-3, so I don’t have a burning desire to see No. 4. Reggie LeDrew asks: Who wins Game of Thrones? Jay: Speaking of things I haven’t seen, Game of Thrones tops the list. I’m literally the worst when it comes to TV or movies. The answer is almost always, “I haven’t seen it.” Thanks for all the questions this week!